← Hundreds of Loving Pets Available for Adoption at Adoptapalooza! Relocating feral cats comes with a unique set of challenges. The consensus of opinion is to leave feral cats where they are unless there is a clear and present risk to their lives. These risks can include the threat of physical harm, or perhaps the cats have lost their caretaker and there is no one else who can provide the daily care the cats deserve. When there is no alternative to relocation, we can only take every precaution available, plan the relocation carefully, and pay logistical attention to the cats’ instinct for survival. This approach will help ensure a successful relocation and assure us that we did our best to improve an impossible situation for the cats. The relocation procedure itself is not easy, but by far the most difficult challenges are to find a safe alternate location for the cats and someone who can commit to their lifelong care. Finding a property owner willing to take on the lifelong care and expense of one feral cat is a challenge, but the chances of finding a new home for a colony of 15 cats rivals the odds of winning the lottery. There is a common myth that horse stables and farms aplenty are willing to offer safe harbor to any feral cat in need. The reality is that most stables and farms already have more cats than they need or worse, they have no cats at all due to the presence of nearby predators, such as foxes or coyotes. In one particular instance, it was decided that a feral cat colony would have a better chance of surviving if they stayed put in their current location during an upcoming construction project than they would have if they were relocated to a farm. Fortunately, this proved to be true. Once the construction began, each day the cats scattered safely away from the noise and bustle. They returned each afternoon at quitting time, and, thanks to the cats’ caretakers who had negotiated with the foreman of the project, they were allowed access to the area. In addition, with the foreman’s permission, the caretakers moved the cats’ feeding station each week to the least active location on the site, and the cats followed their noses to find their food. Most construction sites have 24-hour security, and it has been proven that those on night watch are usually very cooperative about cats and caretakers, especially when given the occasional peace offering from Starbucks. It is often suggested, when a colony of feral cats must be relocated, that they join another existing colony. Caretakers already feeding the other colony need to consider if they have the finances to provide lifelong care for even more cats. Another important factor in adding one feral cat colony to another is to make sure that only neutered cats are involved, since the main mode for transmission of FIV and FeLV is mating. Once feral cats have been moved to a new location, they will need an adjustment period. The process that leads to the highest success rate in relocations involves putting the cats in a confinement pen for two to three weeks while they habituate to the sights, sounds, and smells of their new area. What happens when a cat is immediately released? Very often it is never seen again. A cat released “cold” in the presence of other cats may hit the ground running and never return to the release location where shelter and daily food are provided. The cat, of course, has no way of knowing that the human intention is for the cat to stick around and live happily ever after. A number of confinement pens are available for purchase online. An excellent, if pricey one, suitable for several cats, is available from C&D Pet Products. It comes prepped for very quick and easy assembly. In order to prevent a pen from rocking, it will need to be built on solid, level ground. Otherwise it might be possible for the cats to push up the walls and crawl out from underneath. During their confinement period, for sanitary reasons, it’s important that the cats have litter boxes. These will need to be placed on top of a washable surface, such as cement or linoleum (as shown in the photo of the pen constructed against an existing wall). It is also a good idea to place a shelter inside the pen. It will acquire the cats’ scents and can continue to be used after the cats are set free. During their confinement period, the relocated cats can safely meet the resident cats through the walls of the pen. Once the cats are released, they will decide if the new location is a good place to stay. They will at least know where food and shelter are if they decide to roam or find a spot away from the resident colony. As we all know, some cats welcome new friends and others inexplicably dislike each other at first sight. The success of shotgun weddings is impossible to predict. 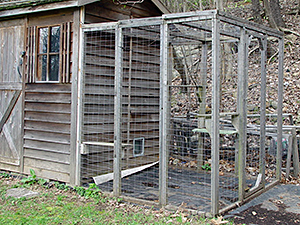 For a few days after the cats’ initial release the enclosure should be left in place with the door secured open. 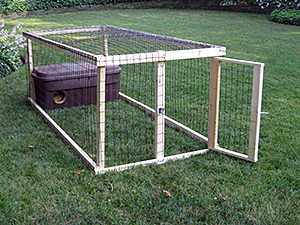 This will allow the cats to return to their own safe place at any time. It will also give the more timid cats a safe space to stay until they feel comfortable enough to interact with the resident cats. There is no way to be certain that all the cats will accept the new location and often a few disappear to find a location more to their liking. That is always a distressing situation, leaving caretakers wondering where the cats are and how they are doing, but one must assume that they have found sufficient food and shelter elsewhere or they would have come back. 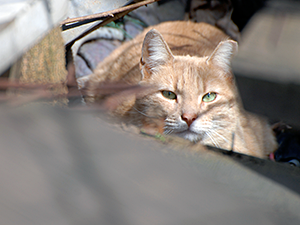 For more information on and ideas about relocating feral cats, visit Alley Cat Allies, ASPCA, and Feral Cat Caretakers Coalition. 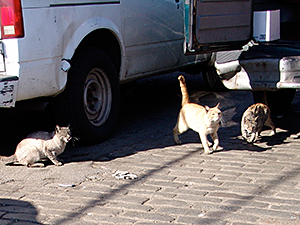 Mike Phillips, LVT, is the Community Outreach Coordinator for the NYC Feral Cat Initiative of the Mayor’s Alliance for NYC’s Animals. Mike prepares presentations for the general public, trappers, and professional audiences; heads up our community outreach efforts; and responds to requests for information about taming feral kittens, trapping assistance, and feral-friendly spay/neuter resources. Mike is a co-founder of Urban Cat League, a former president of Neighborhood Cats, and has worked as the Veterinary Technician Supervisor at the ASPCA Adoption Center in New York City and worked in the ASPCA Animal Hospital’s ICU and on the ASPCA’s Mobile Spay/Neuter Clinic. His tried-and-true taming techniques are featured in Tough Love: Socializing Feral Kittens, a video used by animal shelters around the world. Mike’s “day job” that pays for all that kitty litter is working for New York City Opera, where he’s a resident stage director.